“Obuasi” means: Under the Stone. This is because Obuasi came into being with the Anglo-Gold Ashanti mine located here. There was no town here before the mine appeared. That is why no one is really “from” Obuasi. Because it is a mining town and many people spend their time deep underground mining for gold, its name means under the stone. “Kumasi” stands for: If you Kill One Thousand, One Thousand Will Come Back. Background: Kumasi is less than an hour’s drive from Obuasi. 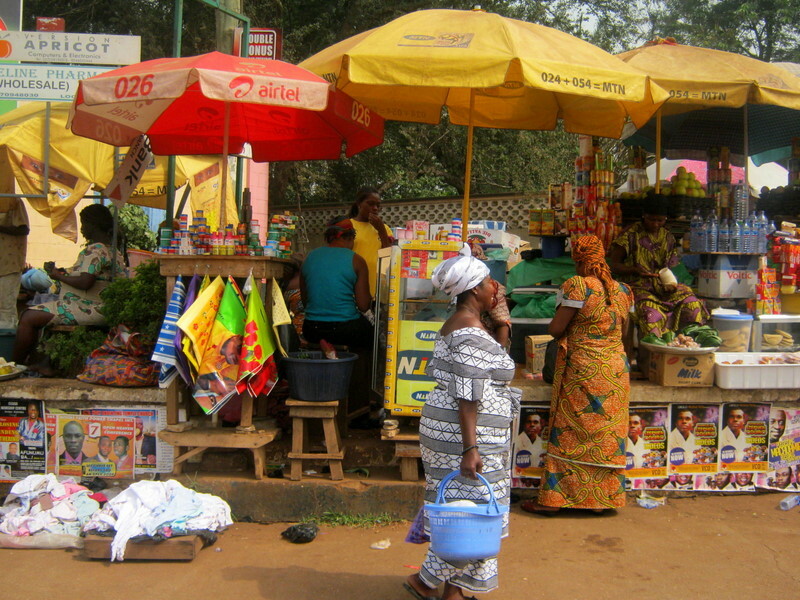 Since 1695, Kumasi has been the capital city of the Ashante Region, about an hour’s drive from Obuasi. With a population of over 1.2million, it is the second-largest city in Ghana (the largest being Accra). Kumasi is a very special place for the Asante people, as it was here that Okomfo Anokye received the Golden Stool from the heavens, the Golden Stool being the embodiment of the Asante nation’s soul as well as a symbol of the Asante Union (Asanteman). To this day, the Asante Kings (Occupiers of the Golden Stool) are buried here, in a mausoleum. They are buried sitting on their thrones, in sort of a mummified state (or so I was told — although I have seen the outside of the mausoleum, I will never be permitted to see the inside of it). I have also been told that in the past, when an Asante King died, 100 people were beheaded to accompany him into the afterlife. Nowadays, only one person is beheaded to accompany him, usually another inhabitant of the Royal Palace. To this day, the Royal Palace still houses professional beheaders (executioners) as well as its own private prison. The motto of the Kumasi, and indeed, the Asante people is “Na kum apim-apim Be Ba”. It means: “If you kill one thousand, one thousand will come back”. The porcupine is a symbol of the Asante people, because just like the quills of a porcupine, “na kum apim-apim Be Ba”. The Asante people do not believe that death is the end of life. They believe that when your body dies, you are reborn into a new human body. “Tomorrow, ghost widows will get husbands”. Her speech inspired the men to fight and roused them into action. For months they fought with great bravery. But then over 1400 British reinforcements arrived in Kumasi. On May 17th, 1901, Nana Yaa Asantwaa and other chiefs (Nana) were sent to live in exile in the Seychelles Islands, where the Queen Mother spent the rest of her days until her death on October 17th, 1921, as a result of a chronic toothache.